Awesome job! If you landed on this page you are most likely one of the CareerBliss Happiest Companies in America! 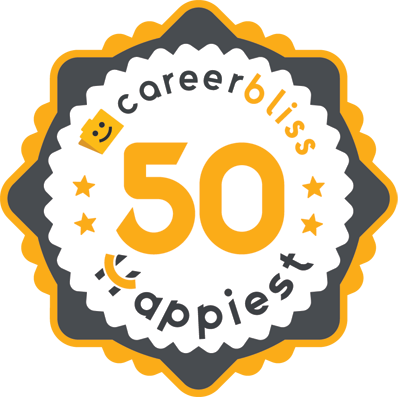 Helping employees be happier at work is what we do and this is the 9th year we have awarded The CareerBliss 50 Happiest Companies in America…congrats if you are here! We analyzed reviews from more than 200,000 companies only 50 make the list. At CareerBliss we live by the statement Choose Happy, by doing what you are doing you are helping people find happier careers every single day. If your PR team would like to show off your great achievement, the winners can use the provided Press Release and high-resolution images of the logo provided below. 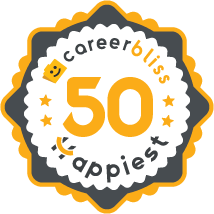 The following are small, medium and large sizes of the official CareerBliss 50 Happiest Companies in America for 2019 logo. Simply save the logo below in the size of your choice and feel free to include it in your website, email signature or press release! Also don’t forget to connect with us on social: Facebook, Twitter, Linkedin, Google+ & Pinterest.